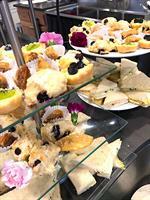 Come celebrate Valentine's Day with High Tea at Mtn Laureal Creek Inn. Cost is $30 per person, and will include several tea sandwiches, scones, lemon curd, assorted desserts, and choice of earl gray or herbal teas. We make everything homemade at the Inn. Bring your special person, or best friend, or both! Event is Thursday, February 14th, with seating options at 12pm, 12:30 or 1pm. $15 depost at booking and balance due after tea. Call 706-867-8134 to reserve your space.